Phyl is 103 years old. She loves doing crosswords. 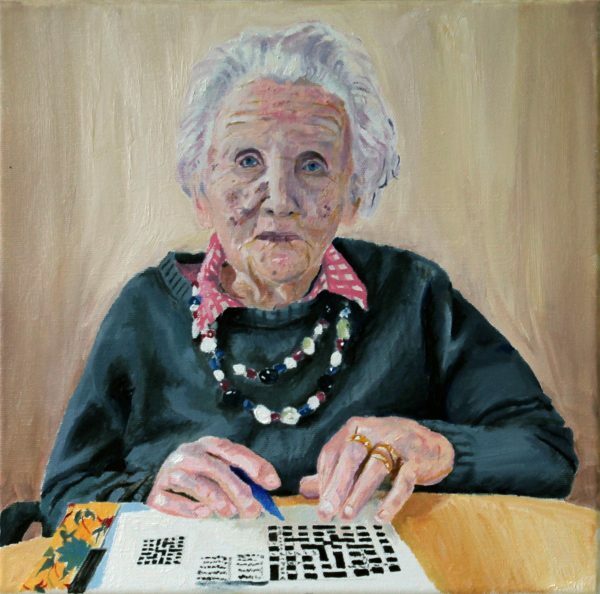 Andy Nie (Year 11) painted Phyl for the exhibition ‘100 portraits of 100 year olds’ (as part of the Centenarian Portrait Project by Teenagers). Andy first met Phyl, along with her daughter Lib, in August at the RSL Care where Phyl resides. He learnt a lot about Phyl’s life during their subsequent meetings. He heard about her childhood (she was born in Toorak) and about her husband, a doctor who served in the Middle East and PNG during WWII. Prior to painting Phyl’s portrait, Andy made multiple pencil sketches of different postures and from various angles. He showed these to Phyl and Lib and asked for their opinions before starting the portrait. He chose the medium of oil on canvas ‘because it is formal and traditional’. The final portrait took a few weeks to complete. The exhibition is now over and Phyl will receive Andy’s portrait.